These cheese puffs almost didn’t get made because I got carried away watching season 3 of the Vampire Diaries. My husband told me anyone my age watching the show should be just plain embarrassed! and I kind of got hooked! Like when I joined Facebook a few years back so I could understand what it was all about before I let my daughter join. But if it wasn’t for the kids I would never, ever have read Twilight, The Hunger Games or know what Gangnam Style was! I managed to tear myself away from the Stefan, Damon, Elena love triangle long enough to get this week’s French Fridays with Dorie recipe done. And lucky I did, because it’s now almost midnight and I’ve just come back home from picking up my daughter and her friends from the cinema. They watched the last Twilight movie and are sitting with tear stained faces telling me about the “horrible shocking twist at the end” while snacking on these bite sized puffs of cheesy comfort. 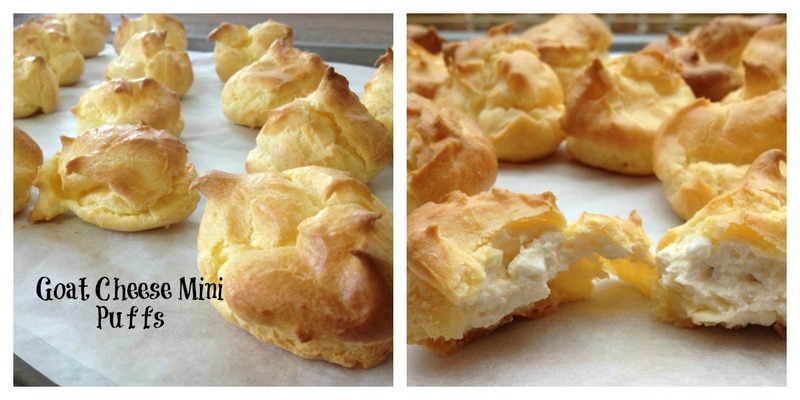 To see more golden cheesy filled puffs click here! Tags: baking, cooking, food, french fridays with dorie, life, my life | Permalink. My girls have drawn me in to many things that no self-respecting adult should ever want to admit to. I’m starting to miss that now that they are “so old” (17 & 18). Kind of fun when you find something fun because you want to keep up to date with the current buzz. Your puffs look wonderful. And I’m sure the girls enjoyed them! Haven’t gotten that far this week, but maybe? You made these with all those fun distractions? Kudos! On the other hand, you have a child to use as an excuse for such behavior. What are those without kids supposed to do? Glad you came up for air to make these – they were good. Great job fitting these in around your pop culture immersion. They look delicious! Wonderful little Goat Cheese Gougères – I love their great warm color! So nice that they turned out to be real “comfort food” for your daughter and her friends after the movies! When my hubby teases me about shows I watch he is typically standing there watching them himself, making a few comments about how he can not believe I am watching this….it is hilarious. I am now totally going to look up these shows. Plus go catch up on all that Twilight stuff. I am clearly behind 🙂 Great job on the mini goat puffs and glad they provided much needed solace after that movie ending ……there is indeed nothing like “cheesy comfort”. You are so funny!!! But seriously don’t feel guilty if you do something that you enjoy no matter how silly it might seem to the rest of the people. By the way I loved The Hunger Games and I was not afraid to say it to the ladies in my book club — funny haven’t heard from them in a while though !!! Anything, anything, you need to do in the name of raising your girls, I support and salute you. It never ends, Sanya. I am on Facebook because my daughter said to do that. I read The Hunger Games because my daughter told me to. She is 45 years old! Have not see the Vampire/Twiling stuff and have no idea what Gangnam Style is. Your goat-filled mini-puffs look delicious and I am glad you had some willing tasters. Your puffs are gorgeous! I have gotten into The Hunger Games (just in time for the first movie) but not the others. Of course my daughter is younger…who knows what she will get me into in a few years. These look delicious. I think kids have a way of keeping their parents current. My mother was a school teacher and seemed to know more about what kids my age were into than I did because she felt like she needed to keep on top of it.